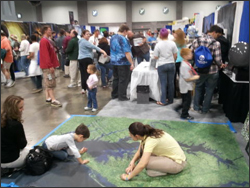 Landsat Part of Science & Engineering Festival in D.C.
Landsat is taking part in the USA Science & Engineering Festival this weekend at the Washington Convention Center in D.C. The event is free. Come learn more about the engineering that goes into building a Landsat satellite and the world’s longest continuous record of Earth’s surface.